Capsule Summary: When Sophie gets sick while Colonel Potter is away, Radar turns to Hawkeye and B.J. for help. Meanwhile, Margaret worries about her appendix. Although it may not seem like it, there’s an awful lot going on in this episode. There’s the A story involving Sophie being sick, the B story involving Margaret’s appendix, and the minor C story involving Klinger’s depression. Depending on whether or not you want to include Colonel Potter’s trip to Tokyo in the A story or not, there may also be a D story. Both the A and B stories include multiple story strands. For example, the A story has Radar being worried, Hawkeye not feeling qualified to care for a horse, and B.J. reaching out to his father-in-law. The B story, on the other hand, has Margaret not wanting Frank to operate on her, Hawkeye making a lot of jokes at Margaret’s expense, and Frank reacting badly to Margaret wanting him far away from her. As you can see, it’s a pretty busy episode and unfortunately that doesn’t leave a lot of time to develop either the B or C stories. I think the A story works pretty well. Margaret’s appendix may have done better as an A story in another episode. Or it may not have been strong enough to anchor an episode. It’s hard to say. It’s odd that so much time is spent on how upset Hawkeye and B.J. are at the prospect of Frank being left in charge without any payoff. 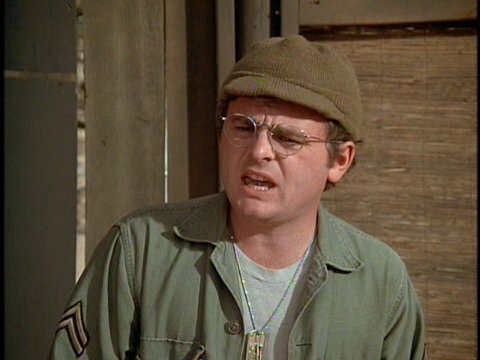 Frank tells Colonel Potter about Hawkeye making a face at him in the Mess Tent but that’s about it. Why so much build up? That time could have been better spent expanding Margaret’s appendix story. Father Mulcahy’s scenes all feel pretty forced, particularly his involvement in the bucket brigade. It’s an amusing scene, even if it does almost last too long, but maybe Father Mulcahy should have been the one handing B.J. the buckets rather than standing awkwardly next to Sophie’s stall. Frank is at his snotty best when he bursts into the O.R. and refuses to leave until Margaret tells him to. Even then, Colonel Potter has to physically push him out of the room. Frank screaming “I hope you have a big scar!” is petty and childish and perfectly in character. Also perfectly in character is Hawkeye when he spends so much time joking around about Margaret’s appendix in her tent. I wonder if there was more to Klinger’s depression story line that ended up cut for time. It feels like it starts abruptly. One minute he’s asking Colonel Potter for fabric, the next he’s suddenly depressed. He almost gets his discharge but ruins his chances by celebrating too early. When Radar finds Sophie on her side in the hay, it sort of looks like a donkey on its side rather than a horse. I really don’t think it’s the same animal. How dangerous is Hawkeye and B.J.’s dart game using needles? Despite having several lines during the bucket brigade scene, Kellye Nakahara isn’t credited for her work in this episode. She’s also has one line in Margaret’s surgery scene. I find it very hard to believe that the military would be shipping a print of Hedy Lamarr’s 1933 Ecstasy around Korea. It wasn’t reportedly banned in the United States at one point and wasn’t released until 1940. Even then, it was never widely seen in theaters. It’s only slightly more believable that someone was able to get their hands on a print and slip it into circulation in Korea. I’ve always felt this is one of those examples of how Season 5 did sort of an about face in terms of how comedic the show was in the hands of Gene Reynolds. With larry Gelbart still at the helm, Season 4 seemed to slowly, yet progressively get a little darker as the season went on to the point it was becoming evident the dramatic undertone of the show was increasing . . . but Season 5, as a whole, goes back to being a little more lighthearted as it was in the first three seasons. There’s really not much I can comment on that RJ hasn’t already mentioned, except I’m almost certain that Klinger was faking depression as another stunt to try to get shipped home – he clearly didn’t seem sincere, and even makes a snide remark at Radar when he congratulates him on winning the Abbott and Costello look-alike contest. I think I’ve spotted something of a blooper in this episode: during the O.R. scene when Hawkeye is examining Margaret’s eyes, Frank starts to say something but Hawkeye does his little fortune-telling bit, cutting him off. I’ve seen that happen one other time in “The Merchant of Korea” where Hawkeye and B.J. offer Charles some of their heat-induced booze – B.J. starts to say something until Hawkeye cuts him off by telling Charles, “you sip it through a fuse.” Hawkeye also, rather awkwardly, does the little fortune-telling bit again in another episode where he’s examining B.J.’s armpit. There’s just one thing I’ve been curious about and never quite knew the answer too: Radar was so determined to get Sophie back into good health before Potter got back, but the tag shows that Potter evidentally found out anyway when he takes Sophie for a walk (while Hawkeye does the same with Margaret) . . . so how did Potter come to find out? Did sonebody mention it to him, confidentially? Did Radar finally fess up about what happened? Klinger’s depression was definitely another stunt, I just feel like it needed something more to get going, which is why I’m curious if there was more that was cut from the episode. If anyone is curious, Quapaw is located in the extreme northeast corner of Oklahoma. It’s near Commerce, where New York Yankees outfielder Mickey Mantle grew up. This was a very funny episode, especially when Hawkeye tried to take Sophie’s temperature. When they are trying to contact BJ’s father via radio they spell his last name – “H-A-Y-D-E-N” – and Hawkeye says in a sing-song voice “M-O-U-S-E”, to the theme song from The Mickey Mouse Club, but the Mickey Mouse Club didn’t air 1955, two years after the war ended. Interestingly Hawk and BJ go on and on about not knowing anything about how to operate on a horse, yet in ” Mulchany’s War” Frank (who both feel superior to) operates successfully on Corp. Cupcake the German Shepherd and no one seems surprised that he was able to operate on a dog out of the blue like that. I always took them going on and on about not knowing anything about horses being more of not wanting to be the ones responsible for making Potter’s horse worse. Also with the Dog, Frank was repairing a physical injury, which probably isn’t THAT much different from doing so on a human, while with the horse they had to actually diagnose an internal, non physical ailment. I just noticed in this episode, when Hawk visits Maraget in her tent, she is hanging clothes. Even her undies were camouflage! I’m glad Sophie was OK, but I’m a little muddled at how it went about. All we hear is a big whinny from Sophie followed by what is apparently her kicking the sidewall of the stable, then Hawk comes out with the OK sign. We know Hawk had to stick the hose up Sophie’s —, but what was the indicator that she was OK? Did she poop or up-chuck the dry grass? Is “cleaning” out a horse with colic that easy? It also seemed strange that of all the people in Korea at the time, nobody knew a vet. Not even in Seoul? They had to call Oklahoma to find out what to do? Just seemed a bit implausible. Frank is very funny in this episode. When he offers to probe Margaret’s stomach, she initially refuses because she doesn’t trust him. Then when she finally lets him, he tries to put his arms around her anyway. Very funny. Then he’s going on about how he will feed her Oreo cookies after removing her appendix. “Show me some consideration and let me cut you open!” Hilarious! It was weird when Potter told Margaret to turn around while he got decent. He was wearing a short sleeved army undershirt, not his underwear. Meanwhile he’s walked around in his robe showing off his legs and has even walked around in that same undershirt in front of lots of people in several previous episodes including the one right before this one. It just struck me as strange that he would react that way over what amounts to a green t-shirt. Calm down Colonel. You’re not indecent.